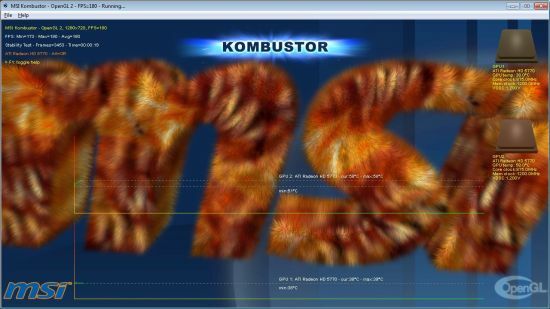 A maintenance release of Kombustor, MSI’s GPU stress test and benchmarking utility included in MSI Afterburner package, is available. More information about the branch 2.x.x of Kombustor can be found HERE. New: added support of Radeon HD 6450, HD 6790, HD 6990 and GeForce GTX 590. New: added a new exe (MSIKombustorGLOnly.exe) that has no dependency with Direct3D. Change: recompiled with the new PhysX SDK 2.8.4.5. 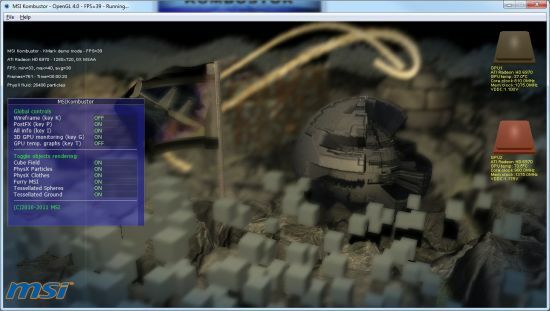 Change: default background image and fur texture for the GPU burn-in module. Bugfix: Settings were not correctly saved. Would like to know where I can report bugs for this tool? There is a problem when trying to run the tool @1920×1080 full screen, I get 1080i instead of 1080p and the displayed image is smaller than full screen and fuzzy (like displaying 1024×768 with aspect ratio). Is there a way to force 1080@60Hz? Thanks.